Set within the grounds of an early 19th century Grade II listed house this series of barns is currently used as annex to the main house. The three barns are used as an office space, workshop and general storage/garage space. 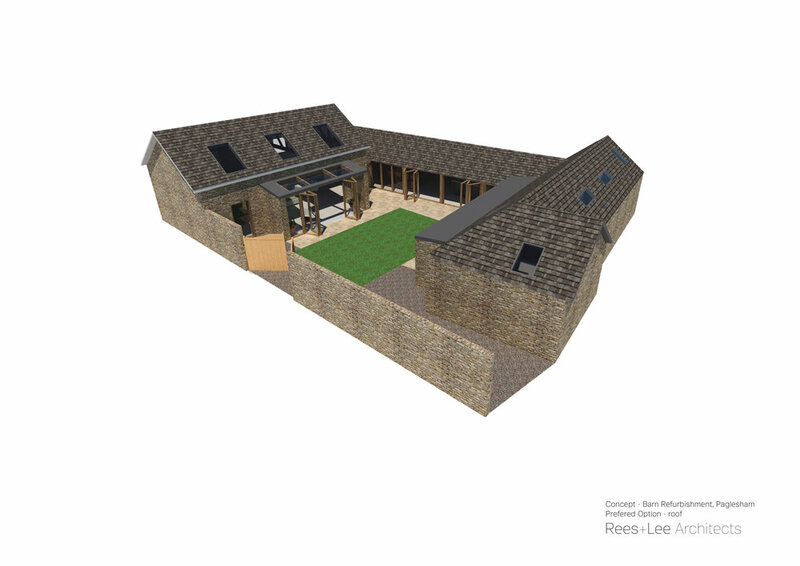 The proposal provides a 3 bedroom house within the barns. Arranged in a U-shape, each barn has been assigned a specific purpose – Living, Eating, Sleeping. The client wished to maintain as much of the original character as possible, so the conceptual approach was simple – modernised barns with a rustic, homely feel. The large barn to the north of the site houses the main formal living room and entertainment area. The large double height space lent itself perfectly to providing an element of grandeur for the new home, the client was keen to maintain this large open space and expose the roof structure adding to the barn aesthetic. On the opposite barn towards the south will be the main sleeping quarters which comprise of 2 double bedrooms, one master bedroom with en suite and dresser and main bathroom. In the central barn which provides the link between the living and sleeping spaces will be the kitchen and dining spaces. Often seen as the most social areas of a home this space becomes the heart of the home, full of activity, smells, warmth and light.